Well that’s the AGM over and we have everyone on board to take on the coming summer’s runs and events. Club nights at the Ericht Alehouse stay as the first and third Tuesdays of the month, that’ll be 16th April, then 7th and 21st May, etc. But evening runs on any Tuesday , leaving the Wellmeadow at 7pm, can happen if it’s good weather, arranged through our members WhatApp group. Our Valhalla Rally is selling well and we’re looking forward to other trips and runs. Hit the “Contact Us” button if you want more info, rally tickets or to join us! 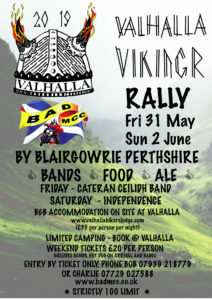 We can now reveal the BAD MCC are holding the first-ever Valhalla Vikingr rally near Blairgowrie at the end of May. Be quick! Limited to the first 100 folk. Great bands, great spot, don’t miss out! Now we’re in the New Year , meetings at the Ericht Alehouse are the first and third Tuesday of each month. So that’s 22nd Jan, 5th and 19th Feb, and 5th and 19th March. Once April comes we’ll meet every week. 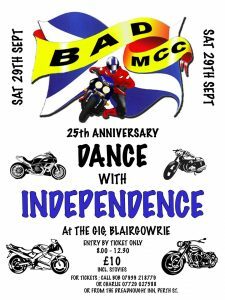 Yes our 25th anniversary dance went brilliantly with over 100 folk there and the dance floor was full all night. Thanks to Independence for a great night of rock, and to all who helped on the night or donated raffle prizes and the Gig for providing the venue. See the Gallery tab for pictures. Our meetings are now on the first and third Tuesdays on the month in the Ericht Alehouse, Wellmeadow, Blairgowrie so the next one will be the 16th October, then 6th and 20th November etc. through to the end of March 2019. Open to anyone who wants to come and talk bikes, blether or haver, or just have a good pint in a real pub! On Tuesday, at the invitation of the proprietors, Ken and Kathy Kincaid, some club members visited The Valhalla Biker’s Lodge at Kirkmichael with a view to assessing its suitability for a future club event. The Lodge offers ensuite log cabin and dormitory accommodation for motorcyclists touring the Scottish Highlands. Run by bikers, for bikers and is a perfect base from which to explore Scotland’s rich history and stunning scenery. Open Wednesday to Sunday all year round, they have secure bike parking, a washdown area and workshop facilities, plus free Wi-Fi, a well-stocked bar, café and restaurant. There’s even a BBQ for use by guests. 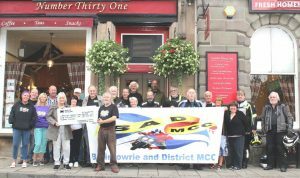 From now on we’ll be meeting in the Ericht Alehouse, in the Wellmeadow, Blairgowrie. It’s the best beer in town to keep us going over the winter! Meetings will be changing to the first and third Tuesday of the month from the start of October, that’s the 2nd and 16th, then 6th and 20th November etc. Our Tuesday evening runs are now finished for the year due to the onset of dark , it’s only going to get darker from now on! Here we all are outside No31 handing over the cheque. Then we went to the Royal Hotel up the road for a meal as our Chippy Run this month – and had an excellent meal. Well done them for coping with so many folk coming through the door at once without booking! And thanks to Alan for taking the pic. This year’s run was the last Maggie’s Run we’ll be running, but we’ll still be raising money now and again to support good causes. We’re going to do the presentation of the cheque for Maggie’s outside No31 on Tuesday 31st July, at 6.45pm. The idea is to do the presentation with the big cheque there and not go to Maggie’s in Dundee this time.We’ll take a photo outside with the banner in the background etc, then go on our Chippy Run so the presentation won’t take long. Depending on the weather, we’ll decide where to go on the day but not too far away, like Dunkeld maybe or Pitlochry or Forfar. Or any other good chippies we haven’t tried yet? Let me know . If you’re a member please try to come along to swell the numbers for the photo, even if you don’t want to come on the run. Anyone’s welcome to join us on the chippy run.